As you may know, Queen E. vacated her throne two weeks ago. 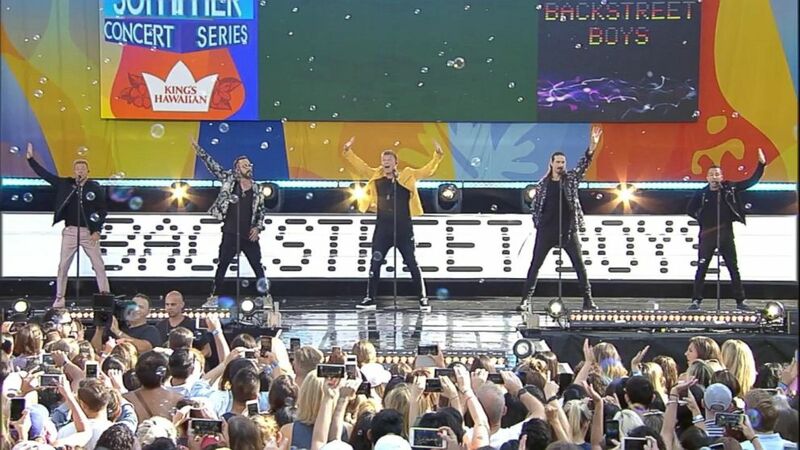 Found some happiness on Friday when the Backstreet Boys played in Central Park. When I heard the promo on Good Morning America for the Summer Concert Series, I grabbed Finnley and made a mad dash for Rumsey Playfield which is a five minute walk from home. It was around 7am and the Boys were rehearsing while thousands of screaming fans sang and danced. When they broke into their huge hit, “Everybody,” two overweight NYC police officers standing in front of me on the periphery of the Playfield started to get down. I joined the dance party, singing along and remembering every word since we were a Backstreet Boy (no to N Sync) household. Finnley began to jump to the beat and happiness reared its lovely head. Friday afternoon I met up with my daughter and we hung out. That space of time spelled happiness. Saturday night at 10:30pm I found another pocket of happiness when Yankee closer Aroldis Chapman finished off the Cleveland Indians in the bottom of the 9th and the Bronx Bombers won a close one, 5-4. Sunday morning I unearthed happiness when Finnley finally resumed eating her regular diet. I was able to coax her back after almost 2 weeks of boycotts…now she is on the same meal program as Madison. Sunday afternoon, I was overwhelmed by hundreds of happy frenchies running down 3rd Avenue, waving the french flag after France defeated Croatia to win the World Cup. Finding happiness in small, innocuous, yet all the right places.